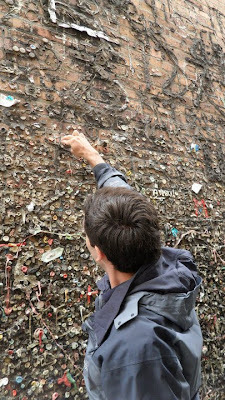 On Day 5, we said good bye to Apple Farms and went to see Gum Alley, a disgusting alley with gum stuck all over the walls! EEEWWW! Forrest made a contribution and we got out of that nastiness! We drove past the San Luis Mission before hitting the road again. Reggie, our plane friend had suggested that we see Hearst Castle. I had heard of this but wasn't that into it, but we decided that since Reggie said so, we should go. I am SO glad we did! It was one of our favorite places! 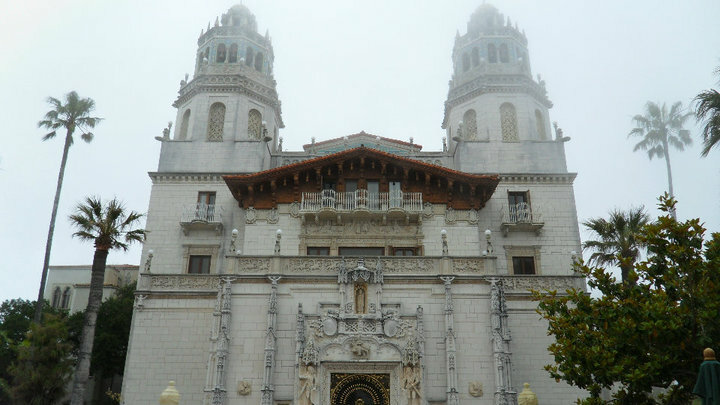 It is the home of William Randolph Hearst and I must say it is magnificent. It has 3 guest houses, each larger than our house, 50 miles of coast (or something like that) a 5000 head beef farm, and much more! The house itself is very European looking and has tons of antiques inside. I could post pic after pic of this place! 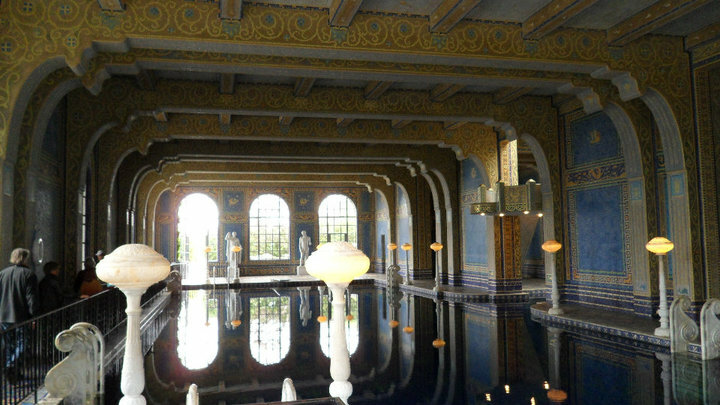 My favorite part was the indoor swimming pool. 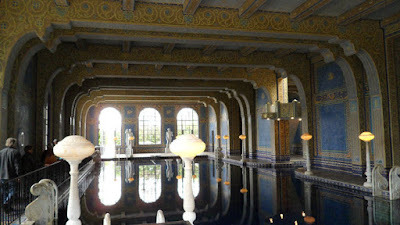 It has real gold in the floor and skylights above it (in the tennis court, no less) that allow the gold to sparkle! If you are ever in California, you MUST go to this place (and eat at In and Out Burger). We want to go back and tour it at night when they have actors there in period dress! After sadly leaving Hearst Castle behind, we made our way to the Elephant Seal Beach, which of course was COVERED in elephant seals. They are not the most adorable of animals, I can assure you, but it was amazing to see such large creatures hanging out in the wild! They were mostly napping and cuddling up on each other, but we did see some come out of the water on their bellies and some threw sad at each other and others would call out "Aaarrr aaarr arrr". It was crazy! 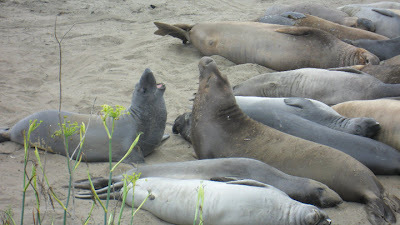 I could have watched those weird little (big) animals all day! We also saw a snake wandering around, but he wasn't near as entertaining and was much more frightening! 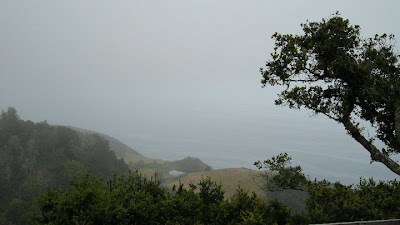 We kept climbing north on Highway 1, witnessing some of the most breathtaking views we have ever encountered. They really kept getting better and better! We'd stop at each "Vista Point" and get out and be amazed by what we saw. I took so many pictures but looking back at them, I realize it is really something you have to see for yourself to appreciate! We went up and down, in and out of beautiful mountains, all the while looking down steep cliffs to jagged rocks below where the waves crashed, just like in movies! 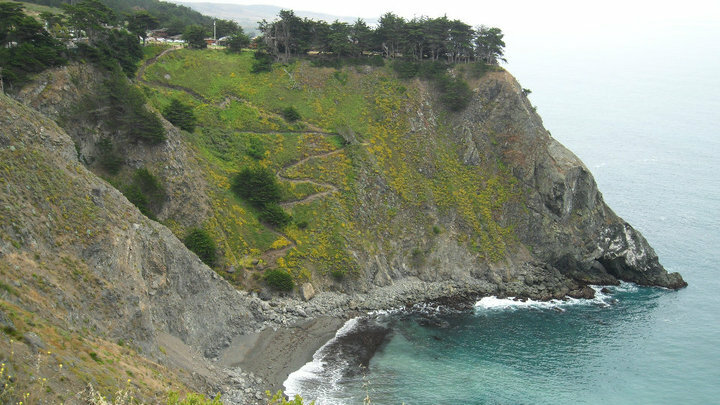 Our favorite places were definitely Ragged Point and Big Sur. It took us several hours just to go a few miles because we kept stopping! For a while, we followed a car that said "FLG8TR", from Montana. A Gator fan from Montana? Really? We ended up meeting them at a "Vista Point" and made sure to give them a good ROLL TIDE! In Big Sur we stopped to eat at a restaurant called Nepenthe. It is GORGEOUS and has wonderful views of the coast. It was freezing but we ate outside anyway to be able to take it all in. Luckily they had heaters for us so we didn't turn to ice cubes! If you are ever traveling in CA, you must go here! The food is wonderful and the restaurant really is a gem. Apparently, it was the owner's home and his wife felt that the views were too beautiful not to share! I know I appreciate that! We also visited their gift shop, which really has some cool stuff, before heading out again. The rest of the drive was so beautiful. What was interesting was that at one point the mountains turned to farm land! We'd see miles and miles of crops planted in neat little rows that ended at the coast. What a lovely way to grow indeed! 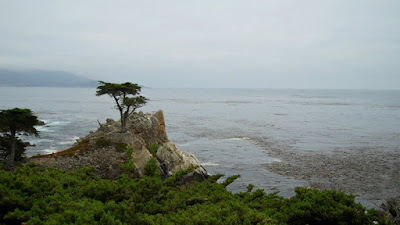 We went through Carmel and in Monterrey we paid to do the 17-Mile Drive, which takes you through Pebble Beach Golf Course, where they hold the US Open. I hate to admit that I was less than impressed with the drive. The golf course was pretty cool. We were able to get out and look around and shop in the gift shops, but the rest of the drive was not that interesting. 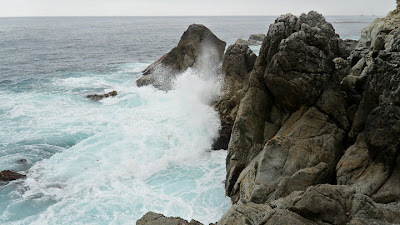 I guess after you drive through Big Sur, there really isn't any need to go anywhere else! After the 17 miles, we got back on 1 and headed up through the agricultural areas until we finally arrived in San Francisco. I was EXHAUSTED by this point and had not had any dinner. We dropped the car off at the airport and got a taxi to our hotel, the Sir Francis Drake, which is in Union Square, the shopping district. We got a great deal on it from Jetsetter. You should definitely join this website--they totally hooked us up! We got a great corner room for literally pennies plus a $40 drink credit for their nightclub, the Starlight Room, voted best club in San Francisco. It was also a Kimpton hotel (like the Palomar we stayed in while we were in ATL for our anniversary in June), so I found the "password" on their facebook page. Saying this at check in earned us a free Pay per View movie of our choice! We felt like royalty in the swanky hotel, but hungry royalty! We ordered pizza from room service and went to bed soon after that. We knew we had a busy day ahead!